From the days of the ‘Young Poland’ movement in the first decades of the Twentieth Century, a prominent strand in Polish music has been made up of composers eager, even determined, either to be in touch with the most ‘advanced’ musical developments elsewhere or, indeed, to be themselves significant innovators. Whether in, say, the Japanese-influenced work of Jan Maklakiewocz, or the experimentalism of composers such as Boguslaw Schaeffer and Kazimierz Serocki, stylistic originality has been one of the hallmarks of a lot of the most interesting Polish music. Fascinating as much such music has been, the danger is that it distracts our attention too completely from the work of more conservative figures. Provided that the composer is true to his/her own sensibility considerations of stylistic innovation ought not to be central to our judgement of his/her work – though the temptation is all too ready to let it be so. 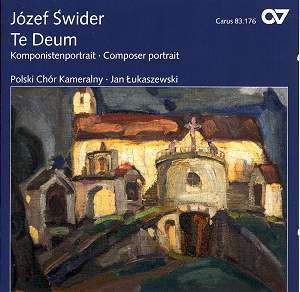 Józef Świder is a predominantly conservative composer, his dominant idioms being essentially diatonic and his works more notable for what they owe to the romantic past than for their anticipations of any musical ‘future’ (real or imaginary). But there is certainly much to admire and enjoy in this selection of his choral works. The most substantial work here is the Te Deum. It is a passionate and flamboyant piece, ringing with praise in its employment of solo voices, organ and two percussionists. There are some splendid noises and the whole communicates a fervour which, while it may not convince one that it is wholly spiritual in nature, is certainly engaging. At times we seem not to be a million miles away from the choral writing of Carl Orff. Both soloists acquit themselves well, soprano being possessed of a particularly striking voice. She is a soloist at the Warsaw Opera. The programme is made up, otherwise, of a series of miniatures – including the aptly titled ‘Missa minima’, which sets the Kyrie eleison, the Sanctus and the Agnus Dei in less than four and a half minutes! Swider’s ‘Cantus gloriosus’ has been taken up by quite a few choirs outside Poland and listening to this excellent performance by the Polish Chamber Choir it isn’t hard to understand why. From the subdued ‘Allelujah’ of its opening measures it builds in complexity and sets its performers quite a number of tests before its climax in a radiant closing ‘Allelujah’. All the tests are passed with flying colours in this performance. Every single one of the fourteen pieces which preface the Te Deum here has things of interest to offer, including, for example, the subtly echoic patterns of ‘Lux perpetua’ or the intimate, dignified textures of ‘Czego chcesz od nas Panie’. After studying with Petrassi in Rome, Swider taught composition, counterpoint and harmony in Poland, largely in Katowice, for some forty years. He has also been much involved in the choral world, as an adjudicator and the like. So, too, has the conductor Jan Łukaszewski, and their sheer professional expertise and experience in the genre is everywhere evident on this CD. The CD booklet contains a general essay on Swider and a certain amount on his choral writing. But it is rather short on dates, which is a shame, as it would have been interesting to try to form some idea of how Swider has developed as a choral composer. Texts are provided, with German translations of the Latin or Polish originals. Connoisseurs of the modern choral tradition will find much to enjoy here.